Cabinetmaking Techniques Stand out from the rest - learn custom cabinetmaking here. Enjoy smaller class sizes, excellent facilities, sustainable practices. This program gives students many project opportunities that develop the foundational knowledge and skills for the cabinetmaking industry. Many hands-on opportunities ensure that graduates are competent in all aspects of the industrial cabinetmaking/woodworking field, from the planning stages to the application of final finishes on various products. 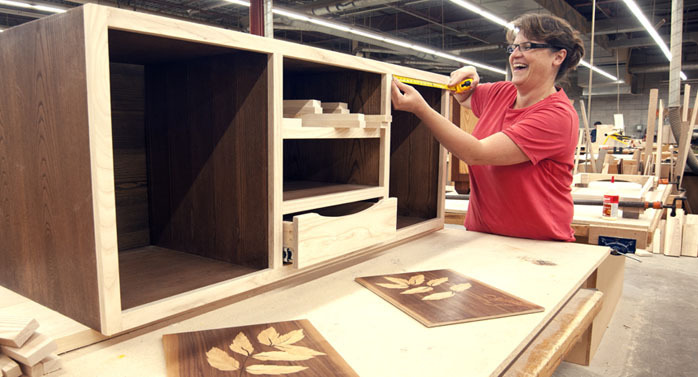 Our graduates enjoy success as employees in custom or production furniture building, millwork, kitchen cabinet making, furniture finishing and residential trim. Potential career opportunities include cabinetmaker, shop supervisor, machine set up technician, or self-employment. A graduate may wish to discuss the possibility of eligibility for apprenticeship credits into the Cabinetmaking apprenticeship program with the Ministry of Training Colleges and Universities.